Thirty years after the infamous '1984 Gas Disaster', caused by the American corporation Union Carbide, (now DOW Chemical Corporation) many families are still trapped in the nightmare that began on a grim, distant night, searching still for the possibility of restoring health and dignity to their community. Today, its poisonous legacy is affecting the health of those who lived on: approximately 100,000 people are chronically ill from the continued effects of the gas leak, while tainted drinking water has caused a sharp increase in birth defects and severe disabilities in children. Over the years, my series of images on water-pollution in Bhopal has been published and exhibited internationally. 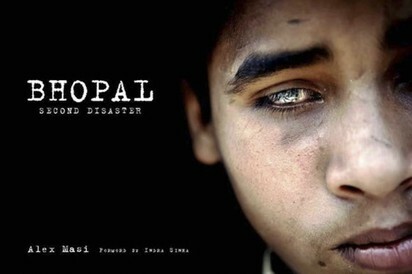 'Bhopal Second Disaster' has also become a hardcover book, in collaboration with FotoEvidence in New York. In the city, the toxic waste left behind after the disaster – and still buried around the abandoned industrial complex – has been penetrating the aquifers used by thousands of destitute local dwellers, with samples as far as three kilometers from the plant showing dangerous levels of pesticides, organo-chlorines and heavy metals. Following the staggering 11.6 billions dollars acquisition of Union Carbide by DOW Chemical in 2001 – the American corporation has single-handedly refused to accept any responsibility for the insidious contamination. Battling for legal and moral compensation, The Bhopal Medical Appeal and other groups of 'gas survivors', are offering legal and medical assistance, physiotherapy, counselling, education and care for thousands of gas and water pollution victims and their children. A long-running lawsuit against DOW Chemical in the USA – sponsored by The Bhopal Medical Appeal and other groups of 1984 ‘Gas Survivors’ – is seeking damages for injury, medical monitoring, and for the mitigation of water and soil. Alarmingly, while defending itself in court, DOW has been recently awarded a ten-year contract as a worldwide Olympic partner, and as the official chemistry company for the Olympic Movement from 2010 to 2020. Throughout the years fighting in courts, remarkable things have also been happening in Bhopal, as political intransigence over the enduring effects of the disasters left the survivors with no choice but to take control of their own destiny. They organized themselves into groups tenaciously campaigning for justice, and even built their own community health programs with remarkable success. Amongst these organizations is Chingari Trust Rehabilitation Centre, founded by Rashida Bi and Champa Devi Shukla, who were suddenly widowed in 1984 and received almost no help for their plight. While documenting the health crisis in Bhopal, I strived to portray my subjects with intimacy, meaning and depth. I observed, and tried to understand the suffering of disabled children and their families, allowed these feelings to lead me when finding expression through my lens. I aimed to present images that would convey emotions, and stimulate our deepest feelings: our senses compassion, brotherhood and justice, in the hope of becoming an active catalyst for the promotion of awareness, action and change for the people of Bhopal. Along its roads I have met many kind, genuine people holding life very dear to their hearts: relentless spirits who have set out to win their battle for justice, and to create a honourable future for those bearing the everlasting scars of Union Carbide’s negligence. Courageous citizens that since 1984 have struggled to hold the culprits accountable, and to inspire others around the world to raise their voices, stand united and support each other. In May 2011, 'The Photographers Giving Back Awards' assigned me a 5000 US$ grant to create and implement a specifically designed plan, benefiting one of my subjects, ﻿Poonam﻿ - and her family, after noticing one of my images of the young girl, then 6, revelling in the rain in ﻿Bhopal﻿, near the abandoned Union Carbide complex.